A: Corfu has a wealth of remarkable gardens that have never been featured in books or articles. I wanted to bring them to people’s attention and to place them into the broader context of the island’s history and of trends in garden design. When I came to Corfu (about 15 years ago), I had previously gardened in Washington DC and Delaware, on the US east coast, and was quite unfamiliar with the local gardening conditions. So, for my bare, terraced Corfiot slope, with its poor clayey soil, torrential winter rain, and fierce bright summers, I sought advice from other garden makers as well as from books. Beyond the practical aspects of gardening, those conversations and new friendships soon got me interested in how the history and culture of Corfu had shaped many of the gardens I saw around me. Q: What’s so special about Corfu? A: Corfu is distinctive for its geography, history, climate, and native plant life. Geographically, because of its strategic position at the mouth of the Adriatic Sea, over the centuries it was hotly contested as both a trading base and a military stronghold. Historically, it differs from the rest of Greece because it never came under Turkish rule, and its culture became much more western than Levantine; it was colonized for five centuries by the Venetians, and then occupied successively by the French and the British until it joined newly independent Greece in 1864. People are fond of saying that culturally Corfu is still at the cusp where the west meets the east. Corfu also has distinctive weather. Though its summers are quite hot and dry they are milder than those in most of mainland Greece. And Corfu’s annual rainfall is double that of Madeira or Sicily, a little higher than that of Washington DC, and 44 percent higher than London’s. Last, Corfu is also distinctive botanically. It has a wide range of habitats—ranging from seaside sand dunes, salt lagoons, and tall cliffs to thick oak woodlands to olive groves and mountain meadows. And because of its geographical position it shares wild plant species with mainland Greece and Italy to the east and west, but also with North Africa to the south and northern Europe to the north. Acting together, these natural and cultural factors have made for a distinctive garden tradition: the island’s gardens have been shaped by their owners’ cosmopolitan culture and by global and mediterranean design trends, as well as by the climate and the wide range of trees and plants that can be grown. Q: How is your book relevant for gardeners outside Corfu? A: I think it should be inspirational for gardeners anywhere, because it contains lots of examples of first-rate designs that will probably get people’s creative juices flowing. More specifically, most of the new gardens in the book, whether by Greek or international designers, embody global trends towards sustainable landscape design. They take their cues from the natural landscape and, with philosophical links to the “plant native” movement, they tend to rely heavily on native plants, materials, and craftsmanship. Their inspiration stems from a desire to respect the environment, to make gardens that feel locally authentic, and also to conserve resources—especially water. These are goals that gardeners everywhere increasingly aspire to, and many of the photos in the book show practical ways to achieve them. For example, some show ways to create beauty and evoke powerful moods without relying on flowers—an approach that’s very useful in areas that have little summer rainfall and/or poor soil. The book does have particular relevance for garden designers and practitioners in mediterranean climate zones— including the US west coast, South Africa, parts of Australia and Chile—who share Corfu’s climate and face many of the same practical challenges. Q: What do you especially like about the old gardens in the book? A: They are so full of atmosphere. With their huge trees and mellow old walls, many have a magical stillness about them. A young friend said to me when we were visiting one of these gardens, “You come through the gate and the fairy-tale begins.” Somehow you sense the presence of people who have loved and cared for these gardens down the centuries, who sought out the shade of their trees, and enjoyed the sound and sight of water in their rills and pools on a hot day. And of course the old gardens are unrivaled for the size of their trees—tall pines, oaks, eucalyptus, and palms, planted in the eighteenth and nineteenth centuries. Q: What makes a garden Corfiot? A: Certain ingredients give a characteristic local feel: stone, ironwork, terracotta urns, native plants, garden plants that are recurring favorites, and a tendency to grow fruit or vegetables along with flowers in gardens that are mainly decorative. You also see some of these elements elsewhere in the Mediterranean basin—for example the use of local stone for building, terracing, and ornament, and the combination of fruit with flowers that’s common in village gardens almost everywhere. A really distinctive Corfiot feature is the use of big terracotta urns, which appear just as much in the gardens of old noble houses as in their contemporary and village counterparts. In the past, these urns were widely used for storage and for exporting olive oil. Another distinctive local feature is wrought iron. Local blacksmiths use old Venetian patterns that have become part of the local vernacular over the centuries, as well as designing their own. Island gardeners also make quite distinctive plant choices. Olive, citrus, and, in the last thirty years, native pencil cypress trees are recurrent favorites, as are Chinese trumpet vine and oleander, which people love for their cheerful colors and general resilience. People also choose a lot of plants for scent: roses, various types of jasmine, gardenias, winter flowering stocks, Brugmansia (angels’ trumpets) in village gardens, and—maybe the most powerfully scented of all—night-flowering Cestrum nocturnum. Q: It’s unusual for a garden book to include a chapter on wild landscapes and plants. Why did you do this? Corfu has long been famous for its beautiful natural landscapes and rich carpets of wild flowers. And despite the encroachments of mass tourism and damage caused by the economic crisis, it still lives up to its reputation as “the garden of the gods”. For contemporary garden designers, its natural beauty makes it an exceptionally good place to practice the approach we spoke about earlier: that is, of being guided by the wild landscape, respecting local environmental conditions and limitations, allowing the “spirit of place” to speak for itself, and taking lessons from what grows wild locally. Many of the gardens we feature exemplify this approach, so I felt it was important for us to illustrate the roots of their inspiration and to help them to be understood within their local context. A second reason is a somewhat practical horticultural one. Many of Corfu’s wildflowers are the precursors of cultivated varieties that are treasured in gardens well beyond the Mediterranean basin. By showing these plants growing in their wild habitats, I think one can convey a lot about their cultural needs and preferences and thus about how to grow their more showy garden relatives successfully. Q: What would you advise someone making a new garden in Corfu? A: Most of my general advice would be about water management. 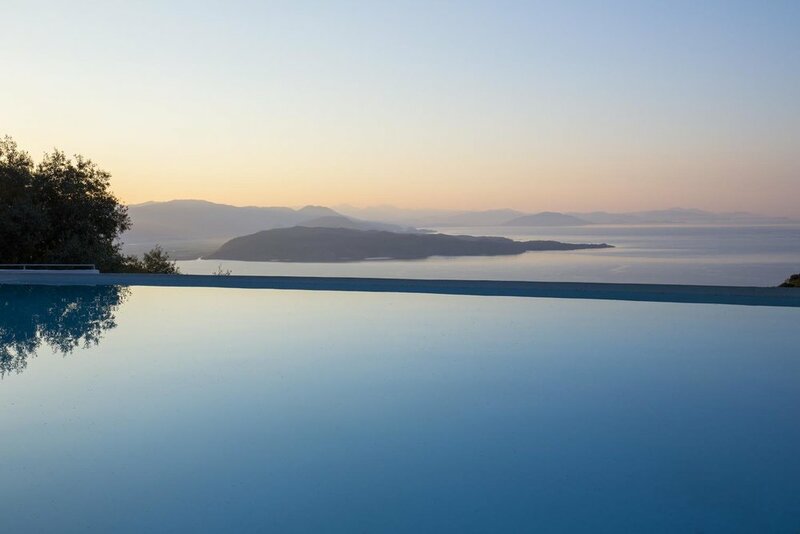 Despite its high annual rainfall, Corfu is dry in the summer and water can be very scarce in the summer months. So have a careful look at what grows wild in the landscape surrounding you, for tips on what will survive in your garden with little water and low maintenance. Plan as much as possible of your garden to go without watering: if you want lush growth and color in the summer, organize it in pots near the house and in the areas you use most. Don’t try to have a traditional grass lawn; it will be hard to keep green in summer and will need water that you—or other people who draw on the same aquifer for their basic household needs—could put to better uses. Lawns of aromatic herbs, such as the one we illustrate at Agnos House, or of Kikuyu grass, as at Villa Levánta, are more drought-resistant. Q: When you created your own garden in Corfu, what problems did you face? A: Poor soil—not because all soils are poor in Corfu but because ours was a new house on a hillside—and a lack of experience with local gardening conditions. To improve the soil it took many years adding manure and compost to lighten it up and make it more fertile and moisture-retentive in the summer. A more personal problem was that I was used to gardening in much more humid summers. I would always get nervous towards the end of the Corfiot summer that certain plants were not going to make it. So I would water them—only to have them die! I gradually found out that by late summer the water in our part of Corfu has such a high concentration of mineral salts it is better kept off the plants, which have turned out to be much less needy than I thought. Q: Where can new gardeners and would-be gardeners in Corfu get help? A: As a start, for general advice I would recommend Heidi Gildemeister’s books—Mediterranean Gardening: A Waterwise Approach (Berkeley and Los Angeles: University of California Press, 2003); and Gardening the Mediterranean Way (New York: Harry N. Abrams, 2004)—and Olivier Filippi’s The Dry Gardening Handbook: Plants and Practices for a Changing Climate (London: Thames and Hudson, 2008) and Planting Design for Dry Gardens (Filbert Press. Filbertpress.com, 2016). Among professional garden designers, those whose work is featured in our book are listed in the Links section of this website; some local garden centers also offer this service. Local gardeners share advice through the Facebook group Corfu Gardens. And twice yearly, in the Spring and Fall, private gardens across the island now open their doors to visitors—this offers a great opportunity to get ideas on design and cultivation and to ask advice. Q: For you, what was the most fun part of creating this book? A: The personal interactions. In the course of researching the book I met and learned from interesting people all over the island. I heard about the history of their homes and gardens and stories about their families and their gardening experiences, and received all kinds of useful tips. People in different walks of life were kind enough to review and correct my draft text and to share their passionate interests in the island’s cultural heritage and its natural environment. Many have since become friends. I would never have met them otherwise!